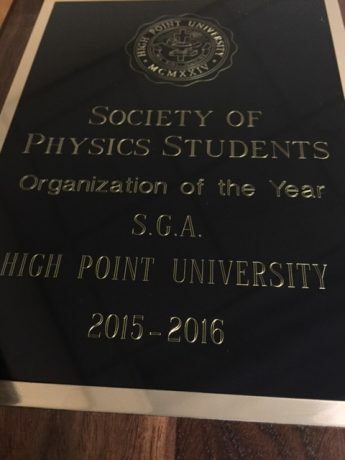 HPU’s student government association named our Society of Physics Students chapter the 2015-2016 HPU Organization of the Year for their successful public outreach and academic events. Senior physics major Hallie Stidham gave a presentation at the annual National Conference on Undergraduate Research (NCUR) in Asheville, NC. 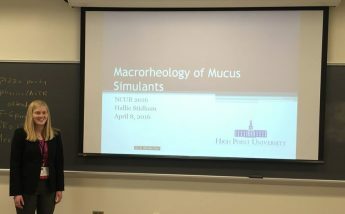 Her research focuses on using a cone and plate rheometer to characterize the bulk fluid properties of agarose, a viscoelastic fluid that has the potential to be a useful mucus mimic.